When Joel Staaf Hästö of Clifftop Games released his debut adventure Kathy Rain in 2016, it turned quite a few heads, feeling like a reincarnation of the classic Gabriel Knight supernatural thrillers. So when the indie developer joined forces with Petter Ljungqvist’s Faravid Interactive, who earned acclaim with his own well-received first effort The Samaritan Paradox, to create a collaborative sophomore title, I’m sure I’m not the only one who was eagerly awaiting the result. Well, the wait is nearly over, and after some hands-on time, I can confirm that the upcoming Whispers of a Machine lives up to its lofty expectations. Though Whispers has no connection to the developers’ previous efforts, those who have played either will immediately feel at home here. 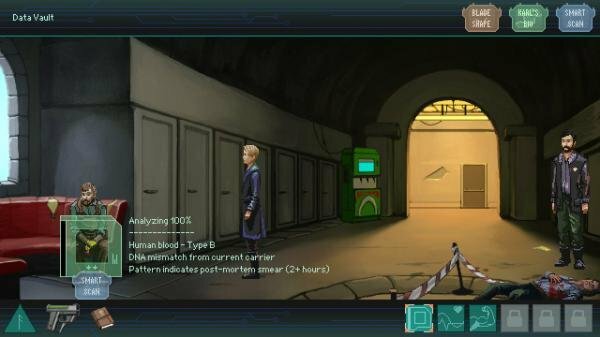 The game is another point-and-click murder mystery, only this time set in a dystopian future, drawing apparent inspiration from classic yarns like Fargo mixed with a healthy dose of Blade Runner. Players take on the role of Vera, a big-city police detective who’s been sent out to this sci-fi world’s equivalent of the boonies – the little burg of Nordsund, a city suspended aboveground on a giant metal plate balanced on a tall pillar – in order to investigate a series of mysterious homicides. Like others in this technologically advanced Nordic society, Vera has several cybernetic augmentations that you can take capitalize on in order to investigate crime scenes, interrogate suspects, and crack the case. 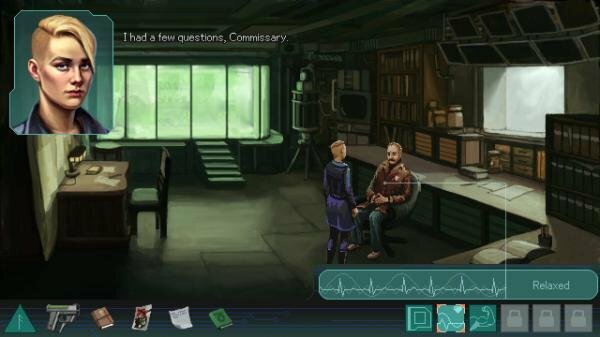 To help set Whispers apart from other traditional point-and-click adventures, the developers have taken full advantage of its sci-fi trappings to invigorate the moment-to-moment gameplay with some interesting enhancements. In the course of her investigation, Vera makes good use of her implants, which go beyond mere words on the screen and actually offer some cool mechanics to mess about with. The most basic tool Vera has at her disposal is an environmental scanning augment, which lets you examine any area on-screen based on specific criteria that you yourself must first select – for example, a certain suspect’s fingerprints or a residual DNA or substance match. Another feature lets Vera measure any suspect’s heart rate during dialog, clueing her (and you) in on when a statement may be hiding further information. There’s also a strength booster that gives Vera some extra muscle power for a few moments when needed, such as allowing her to break into a locker. All of these enhancements must be manually activated – normal environmental observation and unassisted dialog are also possible – and the strength booster is tied to a cooldown to discourage its misuse. In essence, Vera is a full CSI team wrapped into one; perfect for an investigative game like this, actually giving the player tons of agency in uncovering clues beyond merely clicking stuff. There are even three further augment slots that were locked for purposes of the demo. As if that weren’t enough, Whispers also tracks Vera’s choices and dialog responses, setting her down one of three personality tracks – empathetic, assertive, or analytical – which will influence certain parts of the story and the tools available to Vera during her investigation. Even with all of these tools at your fingertips, successful sleuthing is no cakewalk. Over the course of the two-hour preview version, there were several instances where I had to figure out passwords and key codes to unlock doors or log into protected computer files. The solutions to these aren’t simple inventory puzzles, although there are plenty of those to be found as well. Rather, actual clues to be pondered and interpreted – little mini riddles – must be discovered scrawled on notes and written in letters along the way. The added complexity is a welcome addition to the standard adventure fare already present. From being dropped right into the first crime scene (after a quick introduction that shows off the dystopian landscape) to eventually managing to hack the door to a slummy flat known to be frequented by the victim in hopes of finding leads to his killer’s identity, Whispers presents a credible low-fi future noir setting. The game sports a similar faux-retro look of its predecessors, except here the character sprites and portraits are noticeably pixelized while the background environments are depicted in a more painterly art style. While by no means unsightly, opinions may be split on whether the two styles mesh well together, and pixel purists may be sad to see their favorite environment art go. Full voice-over is provided for each character encountered so far, led by Ivy Dupler (Unavowed, Lamplight City, and of course Adventure Gamers’ own Aggie Award narrator) as the game’s protagonist. A full musical background score also accompanies your investigation, featuring understated instrumentals that set an appropriate stage for digging up clues. Those who have already placed this game on their 2019 adventure wish list based on its pedigree can rest assured that Whispers of a Machine looks to be a solid sophomore effort that stays within both developers’ wheelhouses while stretching its wings with some considerable and fun gameplay innovations. 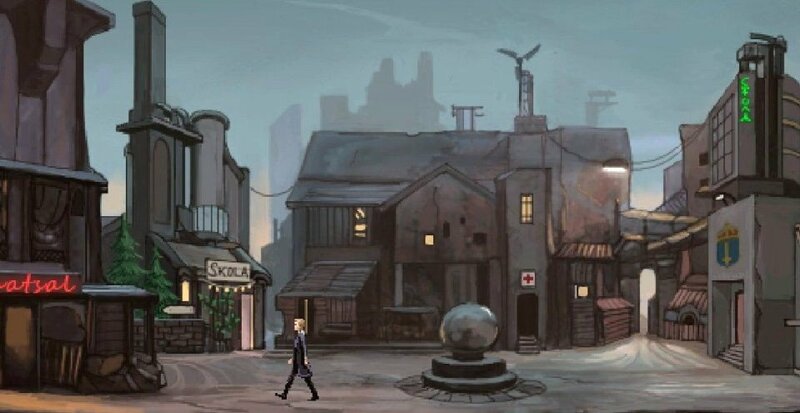 But really, even if you’re not familiar with Kathy Rain or The Samaritan Paradox (yet), anybody with even a passing interest in point-and-click detective mysteries would be well served to keep an eye out for this one. The future of detective stories is nearly upon us, as the game is scheduled to launch on April 17 for Windows, Mac, iOS and Android.